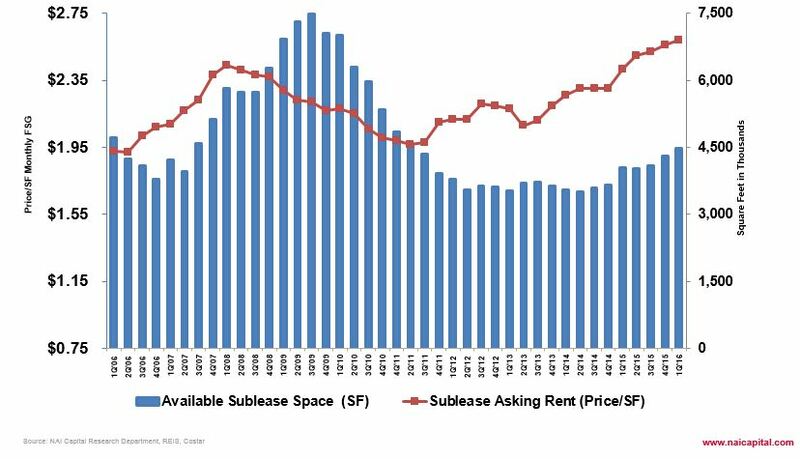 Is More Sublease Supply The First Sign Of A Downturn? LOS ANGELES—Sublease space is up 10.7% from last year, and with rents continuing to rise, this could be signaling a change in the market, Forrest Blake and J.C. Casillas of NAI Capital says in this EXCLUSIVE interview. LOS ANGELES—The supply of sublease space is up 10.7% from the same time last year, but asking rents haven’t fallen, according to a report from NAI Capital that GlobeSt.com has obtained exclusively. The report shows that sublease available space has increased slowly over the past year, while rents have also continued to rise, and as a result, there is a shrinking delta between direct lease rates and sublease rates. This trend could be signaling a potential downturn in the future, according to Forrest Blake and J.C. Casillas of NAI Capital, who produced the report.